We are keeping track of all North American butterfly monitoring programs - and you can see our current list and link to information on each program at our Monitor Tracker. Our goal is to keep an up-to-date list of all butterfly monitoring occurring in North America. Not only does this allow us to connect our visitors and members to programs that they are interested in so they can learn more, participate or obtain access to their data. This also allows us to work with programs to standardize as much as possible and help make sure that each program receives the support it needs to manage and share their data as widely as possible. The graph shown here shows all the general butterfly surveys that we are currently tracking (see our Monitor Tracker for details about each program). These programs all represent general butterfly surveys (meaning all species are counted) and do not include programs focused solely on the monarch (Danaus plexippus). Monarch programs are best accessed through the MonarchNet website (which is currently being redesigned, and will soon be a "sister" site within our program). There are three types of programs included in this figure: Transect programs (green bars) are those based on the European model and have set transects that are walked regularly throughout each season by the same volunteers. These are often called "Butterfly Monitoring Networks" (BMNs). 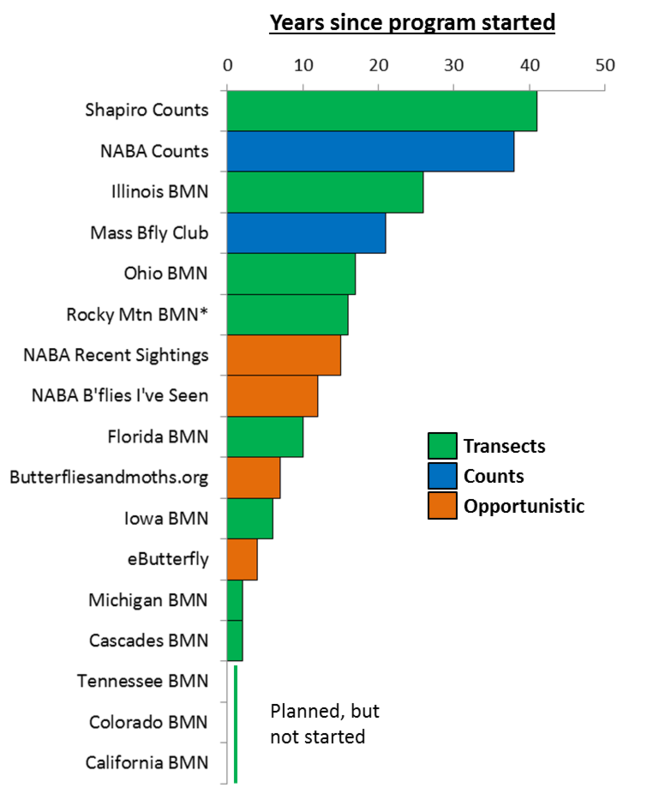 Count programs (blue bars) have fewer protocols and involve groups of volunteers going to set location circles and counting as many butterflies as they can (by species) within a single day. Opportunistic programs are even less structured (orange bars). These can include organized field trips that count all species seen to single observations reported to a website. The programs shown here do not include general biodiversity surveys that also collect data on butterflies, but information on those programs are also linked from our Monitor Tracker. *The Rocky Mtn BMN was a 15 year program that stopped operating in 1996. We also would like to get an inventory of retired programs and work to make sure those data are available to the public as well.